I’ve Got Olympic Fever—And the Only Cure Is More Nationalism! Once again, the Olympics have come and gone. Some of the best athletes from around the world competed to see who could run, swim, row, dive, jump, kick, shoot, spike, spin, flip, and twist faster or higher or more artfully than their opponents. And that part of it was great. Well, some of it was dull as dirt, but some of it was genuinely thrilling and even beautiful. The part of it that I don’t get is where I’m supposed to cheer for the guys and gals who are “representing” Canada. I’m supposed to feel disappointed when these fine young men and women fail to live up to expectations, and I’m supposed to be happy, even proud, when they make it to the podium. And people from other nations are supposed to feel these emotions for the athletes “representing” them. Well, not only do I not feel anything special for Canadian athletes, but I would go so far as to say that such seemingly innocuous nationalistic sentiments are a big part of what’s wrong with the world. For my money, foul-mouthed stand-up comedian Doug Stanhope put it best: “Nationalism does nothing but teach you how to hate people that you never met, and all of a sudden you take pride in accomplishments you had no part in whatsoever…” Now granted, the Olympics are not so big on the hate. 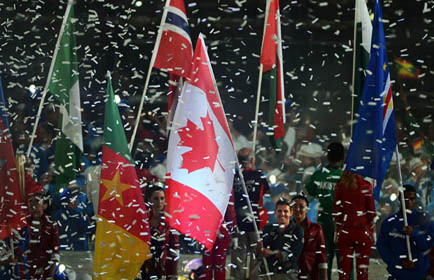 But why should I, simply because I’m Canadian, take pride in the fact that Canada hauled in 18 medals? And should I feel a little less proud because only one of them was a gold? Of course, strictly speaking, “Canada” did not win 18 medals. Rather, Canadian athletes won 18 medals. But why should “we” care one way or the other, much less feel vicarious pride? We didn’t build that. To be clear, I’m not against sporting events per se. I actually like sports, both playing them and watching them. I like watching basketball and American football, and I even root for certain teams (the Celtics and the Patriots). I enjoy watching my fellow human beings perform incredible feats of strength and agility, and struggle to summon extra energy or settle frazzled nerves. Watching tennis star Na Li rally from a 1-5 deficit in the deciding third set of her semi-finals match at the Rogers Cup in Montreal this weekend to win six straight games and take it 7-5 was both exciting and inspiring. I like the way Na Li plays—I refuse on principle to place her family name first, regardless of what is done in her nation—and she’s got a pretty quick wit, too, judging from the times I’ve heard her speak. Why should I give a damn what her nationality is? I did watch some Olympic tennis, including the record-breaking third set of the match between Milos Raonic and Jo-Wilfried Tsonga that took 48 service games to decide. I was impressed that Raonic could give Tsonga such a run for his money, but the fact that we are countrymen was the furthest thing from my mind. In fact, I was happy that Tsonga finally won the match. I enjoy his style of play, and he’s actually my favourite player on the men’s tour at the moment. Different nationality, different mother tongue, different skin colour? I literally could not care less. What about the host country? In an article in the Globe and Mail, Doug Saunders wrote of the “mood of national euphoria” in England following the closing ceremonies, and of the “ineffable value of having organized a very large, very happy event with virtually no flaws, and having looked very good before the world—something that Britain once took for granted, and is likely to enjoy remembering for some time.” The implication is that Britain should feel proud of the great job it did hosting the Games. "Not only do I not feel anything special for Canadian athletes, but I would go so far as to say that such seemingly innocuous nationalistic sentiments are a big part of what’s wrong with the world." Similarly, as a Canadian taxpayer, I financed some tiny fraction of the training of the Canadian athletes participating at these Games, who were subsidized to the tune of $96 million over the last four years. (For those of you keeping track at home, that’s five million and change per Canadian medal.) The thing is, paying taxes is not really something a person does; it’s something that is done to a person. I cannot therefore reasonably feel proud of what is done with those dollars once they are taken out of my account against my will, and neither should the British taxpayer. On a trip to Ottawa a few years ago, I saw a bumper sticker that captured my feelings about Canada: “I love my country, but I’m afraid of my government.” Canada is a fine place with many fine people who continue to enjoy the echoes of a strong classical liberal tradition. But those “representing” us (there’s that word again) in the halls of power are not generally speaking the finest of those fine people. For one thing, they all seem to be nationalists of one stripe or another. I suppose it wasn’t surprising to see Pauline Marois, leader of the separatist Parti Québécois, celebrate the fact that Canada’s first four medals were won by Quebecers. Rather more disappointing was how all three major provincial party leaders were competing to oppose the purchase of homegrown Rona by US rival Lowe’s. The race for gold in the “economic nationalism” event was too close to call. Someone is surely going to argue that the Olympics are all about the nations of the world coming together in friendship. Well first of all, at the risk of beating a dead dressage horse, “nations” cannot be friends. Only people can be friends, and some of the Olympians probably made some new connections. But do the Olympics help people from different parts of the world adopt friendlier attitudes toward one another? An American basketball team packed with NBA superstars rolling roughshod over every other team tells a different tale, as does the rash of below-the-belt punching in the quest for basketball gold. And how about those bad calls against the Canadian women’s soccer team, denying them a chance to play for gold? That really promotes friendly international relations. One parting shot: I’ll take the human achievement of the Mars landing over the nationalistic achievements of the Olympics any day. And although again, the taxpayer funds used to pay for it rub me the wrong way, at $2.5 billion, the price tag was roughly 1/6 as large as the Olympic tab. Some kind of reverence for imaginary lines on a map seems to be deeply ingrained in most people, but to me, honestly, winning a medal “for your country” is only slightly less creepy than winning one for your Dear Leader. I prefer the humanist sentiment of elation of one Western writer (I’ve tried in vain to relocate his name) who, upon seeing the Great Wall of China for the first time, exclaimed, “My people built that.” Human beings can do great things, which should be a source of encouragement and inspiration for us all, regardless of the colours of our passports.